The Beatles´ early songs, like most pop songs of their time, dealt mainly in superficial clichés about love and romance. But as the Beatles matured their lyrical content deepened considerably. During the 1960s and into the 1970s, the Beatles, as a major icon of the era, served as a flashpoint for a number of moral, political, and cultural issues. None was as passionately contested, from both sides, as that of their experimentation with altered states of consciousness, first through drugs and later through meditative practices. While the Establishment vilified them as pied pipers of psychedelia and godless gurus and the Counterculture celebrated them as holy prophets of a New Age, the Beatles themselves seemed always to defy the images promoted by either side, often by the recognizably philosophical maneuver of posing new questions rather than advocating entrenched views and values. 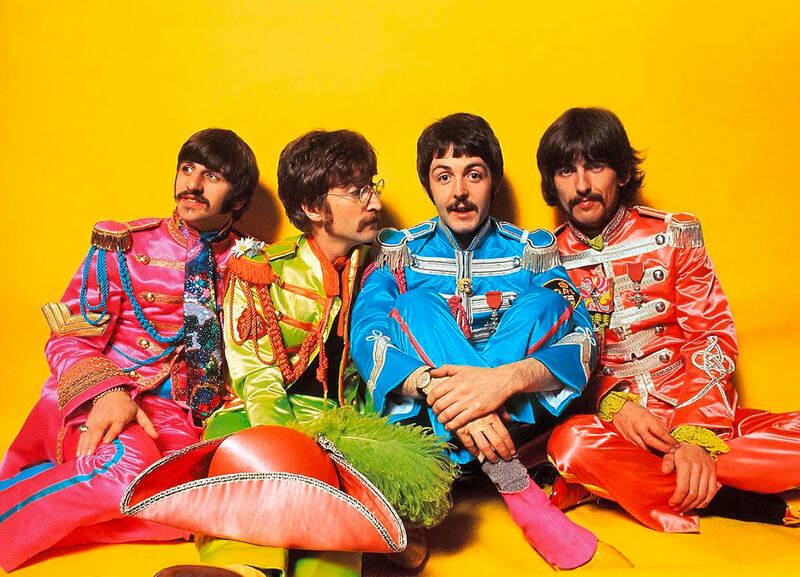 Since the 1960s many Beatles fans have suspected that the title of John Lennon´s song “Lucy in the Sky with Diamonds” was really a clandestine reference to the psychedelic drug LSD. Lennon himself tried to put such speculation to rest through his own personal disclaimer. However, in June of 2004 Paul McCartney resurrected this issue asserting that “Lucy in the Sky With Diamonds” really was a reference to LSD. Whether or not we choose to believe Lennon´s or McCartney´s take on this particular song´s inspiration, it is clear that the Beatles did encounter LSD and were transformed by its influence – and transformed in ways that were clearly reflected in their music. This transformation of the Beatles followed a pattern that was repeated among many members of the youth culture of the 1960s: intense hallucinatory experiences inspired by LSD, and exposure to the ideas expressed in the texts of Eastern Philosophy. The consummation of this combination of experiences for the Beatles was a trip to India and a course of study under the guidance of the Maharishi Yogi. Yet, even before the Beatles encountered LSD or Maharishi, they had already begun to develop an interest in Eastern culture. This interest, John Lennon tells us, was inspired by the Indian musicians who were employed during the making of the movie Help! (Beatles Anthology, p. 171). The contribution of these Indian musicians can be seen in a restaurant scene in the movie, and can be heard on the film´s musical soundtrack as well. Their resulting influence was apparent on the Beatles next album Rubber Soul which featured George playing a sitar on “Norwegian Wood.” With their next album Revolver the Beatles had clearly gone beyond the adoption of a sitar and had begun to take a deeper interest in Indian Philosophy. Two books, with which the Beatles became familiar, may explain why their experiences with LSD prompted an interest in Eastern Philosophy. The first book is Aldous Huxley´s The Doors of Perception, perhaps the first instance of a major author examining his own experiences with psychotropic substances from within the context of the tenets of Eastern Philosophy. Not surprisingly Huxley appears in the crowd on the Sgt. Pepper album cover and The Doors of Perception became quite popular in the 1960s. Perhaps even more important was The Psychedelic Experience: A Manual Based on the Tibetan Book of the Dead, a book published by Timothy Leary, his Harvard colleague Richard Alpert (later “Baba Ram Dass”) and Richard Metzner. This book offered a very explicit interpretation of the relationship between Eastern thought and the hallucinatory experiences produced by LSD. John Lennon refers to The Psychedelic Experience in explaining the inspiration for his song “Tomorrow Never Knows” from Revolver (Beatles anthology, p. 209). A consideration of this book, as well as Huxley´s book, is indispensable to any effort of deciphering principles of Eastern philosophy in the music of the Beatles. What makes The Psychedelic Experience so important in its influence on the Beatles (outside of the credit John Lennon gives to it), is that it was based on a text which emerged from Tibetan Buddhism – The Tibetan Book of the Dead. In this text we find the expression of a host of ideas and concepts which are common to several Eastern traditions, especially the Buddhist and Hindu traditions. First and foremost is the idea that the human soul is engaged on a journey of increasing self-realization which spans many lifetimes. The Tibetan Book of the Dead is a guide for these souls who, while approaching death, may have either failed in the task of self-realization during their present lifetime, or may yet have the potential to “see the truth” at their moment of death and, through such self-realization, escape the never-ending cycle of death and re-birth – the meaning of Nirvana (or freedom from re-birth) and the ultimate goal of human life. Individuals approaching death are in need of guidance for negotiating the transition into the very different reality we encounter after death, and before our subsequent re-birth. According to Timothy Leary and his colleagues who wrote The Psychedelic Experience this “different reality” – described in this ancient text – resembled the reality experienced following the ingestion of LSD and other psychotropic substances. In other words, these substances have the potential to induce an experience which simulates all of the psychological significance of death – “ego death” and transcendence of our ordinary worldly experience. The “manual” Leary and his colleagues created was specifically aimed at directing an individual who was engaged in such a “trip” and thus approaching transcendence or “ego death.” As John Lennon recalled “we followed his instructions in his ‘how to take a trip’ book” (Beatles Anthology, p. 209). This kind of guidance was deemed necessary to help direct the individual through the awe – and sometimes panic – which was often induced during the most intense stages of the psychedelic experience. It was at these stages of the LSD trip that death, from a psychological – or what philosopher´s term phenomenological perspective – appeared most imminent. Phenomenology is a form of philosophical inquiry concerned with descriptions of any phenomena by means of direct awareness and our subjective experience. An appreciation of the phenomenology of the psychedelic experience goes a long way toward explaining the meaning of a bad trip – where the individual will alternately experience a range of frightening thoughts and hallucinations which can inspire intense panic, depression, and paranoia, and which led more than one seeker to conclude his or her trip in a hospital. The message and guidance offered by John Lennon in “Tomorrow Never Knows” is the same provided by The Tibetan Book of the Dead and The Psychedelic Experience. When the Beatles sing “Turn off your mind, relax and float down stream, it is not dying,” they are repeating the advice of those books. In spite of the onset of the subjective experience of death – and accompanying panic – the seeker is encouraged to close the eyes, and “relax.” Likewise, the lyric “lay down all thoughts surrender to the void” echoes the advice of these texts. Yet, one may still ask, what value lies in “surrendering to the void” – other than overcoming the panic and paranoia of a bad trip? The answer is a fundamental theme of Eastern philosophy which emerges in more than one Beatles song: by surrendering to the void, we encounter a spiritual revelation of life´s fundamental reality through an experience of transcendence – also known as the “Clear Light” which is, as the Beatles sing, “shining.” The elucidation of this fundamental reality characterizes the metaphysics, theory of reality, of the Vedanta branch of Indian Philosophy. Even from a purely musical perspective, it must be added, John Lennon was quite clear about the purpose of the unusual sound of “Tomorrow Never Knows.” He was trying to recreate the sound of “thousands of monks chanting.” While John felt unsuccessful in his attempts to recreate that sound, the fundamental inspiration for the song´s lyrics remains. “Tomorrow Never Knows” marks the beginning of the Beatles´ numerous expressions of ideas that characterize Vedanta. Vedanta is concerned with metaphysics, life´s ultimate reality: the underlying unity of all of creation, and the role of maya – illusion – in undermining our comprehension of this fundamental reality. The relationship between maya and Brahman (the ultimate reality) is traditionally depicted as analogous to the relation between the ocean (Brahman) and its transitory waves (maya). Yet, this is only an analogy. The ultimate reality must be experienced to be understood. And this is where it goes wrong for many Westerners whose minds are extremely affected by psychology. The misinterpretation is: what in Eastern philosophy is considered to be ontological realms, is in Western thought misjudged as psychological realms. Ontology is the philosophical study of the nature of being, becoming, existence, or reality, as well as the basic categories of being and their relations. Psychology is the science of behavior and mind, including conscious and unconscious phenomena, as well as thought. Two different areas of study, and if you confuse these two things then the slippery slope into using drugs in order to attain an experience of reality has been created. You could say that reality has been reduced to psychology, it has been psychologized. You could also say that what in Eastern philosophy is considered to be external, is in Western thought misjudged as being internal. As for the value of The Psychedelic Experience as a tripper´s manual, it was certainty used in that way by thousands of people during the 1960s, and may have provided a helpful reference point for some who would otherwise have plunged into their first journey with no context at all. In retrospect, however, the conjunction of bardo state experiences (experience of ontological realms) and the psychedelic plateau (the experience of psychological realms) seems more than a bit forced, and the insistence on the desirability of losing the ego also seems naïve. “Ego-freedom” might be a more appropriate goal than “ego death”: the ego is our particular lens for perceiving reality, connected to both the physical body, the painbody, and the astral body (all ontological entities). Therefore loss of it would be disastrous. The concept of “ego-death” is of course connected to The Tibetan Book of the Dead, which is a guide to the experience of the actual death-process (an ontological event), and is therefore utterly misunderstood. A typical distortion based on the psychologizing of philosophy, where ontological realms are misunderstood as psychological realms. Such a distortion is due to the intellectual laziness typical for Westerners, who don´t bother to practice the preliminary exercises, indeed, even just to consider themselves as ignorant (see my booklet The Psychedelic Experience versus The Mystical Experience). Throughout The Psychedelic Experience we find an emphasis, entirely lacking in the Tibetan Book of the Dead, on “the selfish, game-involved nature of man,” “selfish game desire,” “the return to game reality,” “the ego-game,” and so on. In short: a reduction to Western psychology and psychotherapy. While Buddhism recognizes the “basic goodness” of our essential human nature, obscured by karma, the writers of the manual seem mired in a Puritanical and sin-stained conception of the individual. Apparently, the tripper´s nefarious ambitions to succeed in the game-worlds of modern life needed to be purged in the hallucinatory fire of the entheogenic encounter. In this respect and many others, The Psychedelic Experience overlays a simplistic and moralizing psychological perspective on the subtler and more profound exegesis of an ancient spiritual philosophy found in the original text. One has to remember the obvious fact that the Tibetan Book of the Dead is a manual in what happens during the actual physical death process, and is meant to be read aloud to a person who is dying, not to a person in a psychedelic trip. What´s impressive about the Beatles though, is that their artistic passion also allows the central philosophical virtue: think for yourself! (which also is central in Eastern Philosophy). The Beatles just wanted to create beautiful and interesting music, and this is hindered if some authority dictates you what to think. In that way we see the same development in the Beatles as we saw in my pop culture file on Monty Python, which also developed beyond their countercultural roots. Interesting enough then Monty Python´s movie Life of Brian (which central message is Think for Yourself) were only made possible with a little help from a friend: George Harrison. George Harrison has offered a contrasting interpretation of the meaning of “Tomorrow Never Knows.” In The Beatles Anthology he suggests that what Lennon was really getting at, is what meditation has merit since the goal of meditation is also an experience of transcendence – the shining “void” of Being (in this case an experience of the ultimate ontological being, and not a psychological drug-induced experience). Nonetheless, given John Lennon´s confession about the inspiration for this song, George´s comments reveal his attempt to separate this song from its drug-induced context and origin. This perhaps reflects George´s own well-founded disillusionment with psychedelics which was, in part, brought on by his visit to San Francisco´s Hight-Ashbury district in the 1960s. Rather than finding “hippie” spiritual seekers, he found a lot of kids virtually homeless and strung-out on drugs. What George had discovered is a point underscored more recently by religious scholar Huston Smith: while there is little doubt that certain kinds of psychotropic substances may induce religious or spiritual experiences, nonetheless, it is equally clear that these experiences alone do not necessarily lead to a more religious or spiritual life. And a spiritual life as a yogi was what George Harrison, maybe more than any other in the Beatles, was looking for. In George Harrison´s song “Within You, Without You” we find the consummate expression of Vedanta and Indian Philosophy in the Beatles´ songbook. Indeed, by employing Indian musicians to accompany this song, George left little doubt about the underlying message. It has been over fifty years since the heyday of the 1960s and the brief flowering of the psychedelic era that ended abruptly when Woodstock gave way to Altamont, the achievements of SDS (Students for a Democratic Society) were obscured by the terrorist acts of the Weathermen, and sensitive Beatles lyrics inspired the homicidal rages of Charles Manson´s Family. Nobody can say for certain to what extent psychedelic use led to the radical inquiry and eventual degeneration of the 1960s spirit – it was certainly one element in a much larger story. In the wake of the ´60s, many commentators from across the political spectrum found it convenient to blame psychedelics for some of the period´s destructive excesses. Suppressed, interdicted, and generally reviled, mind-altering substances such as LSD, mescaline, mushrooms, and ayahuasca have not received a serious reconsideration since that time. Today, it is hard for us to imagine that long-ago moment when Ivy League professors, established intellectuals, film stars, famous people, and millionaires sincerely believed that the exploration of non-ordinary states of consciousness through chemical means could induce a radical transformation of the individual and the society - without that people had do anything except for taking the drug. The psychedelic era of the 1960s could be seen as an attempted mass-cultural voyage of “shamanic initiation.” Because our culture lacks the proper frame of reference and background, as well as elders and wisdom-keepers who could guide the process, the effort reached a certain point and then short-circuited. Cultural figures like Leary and Lennon were thrust into the role of psychopomps, although they had not undergone the types of rigorous training demanded of shamanic candidates in traditional cultures. By the end of the 1960s, mechanisms of social repression – such as the Nixon-instituted “War on Drugs,” which continues today, incarcerating millions of nonviolent users of interdicted substances – had kicked into gear. The movements of personal liberation made permanent changes in Western culture, but the initiatory process remained incomplete. Today, over fifty years after the “Summer of Love,” it is possible that our culture, with works like Stanislav Grof´s (and The Matrix Conspiracy as such), is on the cusp of undergoing a second, much deeper phase of this “initiatory” crusade; deeply inspired by the intellectual laziness coming from the American anti-intellectual movement (see the Matrix dictionary entry Anti-intellectualism and Anti-science and my booklet The Psychedelic Experience versus The Mystical Experience). But the Beatles began to look for meditation instead of drugs. In other songs by John and Paul, some of these themes emerge. “The Fool on the Hill” and “Across the Universe,” complete our look at the most important lyrical preoccupations of the Beatles with Eastern Philosophy. The fool on the hill, while exhibiting his “foolish grin” is “keeping perfectly still” – as one does in meditation. In later years, Paul McCartney acknowledged that the inspiration for the song was in fact Maharishi Mahesh Yogi – or, at least, someone “like” him: an individual whose perception of reality is at once, more complete and more accurate than the average person (being a knower, as it were of Brahman). To “see the world spinning around” captures the idea that the “fool´s” grasp of reality is larger and more inclusive than the ordinary individual´s perception. Yet, by virtue of such a perspective, this individual places him or herself at odds with the rest of humanity whose vision of the “truth” is limited to the “reduced” awareness described by Huxley. Here´s an individual who sees the world as it really is. With “The Fool on the Hill” we also find a clearer expression of the goal of life of self-discovery and self-realization. Experiencing Brahman is to experience the deepest reality within oneself, distinguishing it as a state of Self-consciousness. This ultimate experience of Self-consciousness is said to bring with it the characteristics and qualities of Sat-Chit-Ananda: the pure absolute state of bliss-consciousness, and hence accounts for what may appear as a “foolish grin” to the unenlightened (Bhagavad Gita, pp. 440-41). In “Across the Universe,” these sentiments find their most mature expression. “Across the Universe” was written by John Lennon in India while the Beatles were staying at Maharishi´s ashram. The song thus marks a period of time in which the Beatles were, at once, most immersed in Indian Philosophy, and almost also most free of drugs. “Across the Universe” represents the clearest expression of John Lennon´s take on Maharishi´s many discourses on The Bhagavad-Gita. Among the principal features of The Bhagavad-Gita, is a delineation of the meaning of an integrated, enlightened life of full Self-realization. While the philosophy of Vedanta occupies portions of The Bhagavad-Gita, it is equally concerned with the basic tenets of Yoga Philosophy. The Sanskrit term yoga has the same root meaning as out term “yoke”: a word for uniting or bringing together. Yoga Philosophy is concerned with the techniques that foster the integration or union of the individual with cosmic life – Brahman. In the yoga of meditation, a mantra is used as a technique for fostering an experience of transcendence (Om or Aum, being the most widely known mantra). The various disciplines and techniques of Yoga Philosophy comprise a body of knowledge which is, traditionally, passed on from master to disciple for the purpose of experiencing the truth embodied in Vedanta. After all, this is a truth that goes beyond words and must be experienced to be understood. There is an almost comical story of Krishnamurti meeting the Maharishi. Travelling to Delhi by air in 1974, he found himself leaving a plane with the Maharishi, who rushed to greet Krishnamurti, clutching a flower, and suggesting a co-operation between the two. Krishnamurti rapidly made his apologies and left alone, while the crowd gathered around the Maharishi. It says something important about Krishnamurti, whom I believe is the most clear example of an enlightened master in our time, who teaches in a purely philosophical way. So one problem with the strategy of following leaders is that the “leaders” are as human and fallible as we are. While some of them are as knowledgeable and honest as they are advertised to be, others are utterly ordinary, and still others are incompetents and charlatans. In the former time´s spiritual pedagogics the teacher took the central place in so-called energy-mandalas, whereby the hierarchical structure was able to be unfold (Christ and Buddha in the centre). In the newer time´s spiritual pedagogics (maybe because of the Ego-extreme in our time,) the true spiritual development aims towards holding free the center of the circles, whereby an ideal equal spirituality can begin to unfold. This development is especially represented by Krishnamurti, who in this way seeks to make the Source common. In such a mandala-structure that, which before symbolical was gathered in the centre, is now unfolded and made common in the periphery. The aim is completely to avoid the guru-centric. Anybody, who has worked with Krishnamurti´s teaching, can recognize this. And in the connection with philosophy this is also interesting since Krishnamurti´s teaching in that way follows the central virtue of philosophy: Think for Yourself! Indeed, his teaching is characterized by the use of philosophy, instead of religious preaching or psychotherapy (see my article The Philosophy of Krishnamurti). During the decade of the 1960s philosophers and policy makers came to face a host of new, largely unsuspected challenges that went to the heart of their enterprises. Many, both intellectuals such as Professor Timothy Leary and Norman O. Brown as well as representatives of the Counterculture such as Ken Kesey, the Grateful Dead, and Jefferson Airplane, viewed experimentation with “alternative states of consciousness” as ushering in a new era of human liberation and self-realization, an “Age of Aquarius” as it was sometimes called, an expression we today see continued in the New Age movement, where also a renaissance in the use of psychedelics is seen. Others, usually representing “the Establishment,” responded by sustained attempts to discredit these “New Age” experiments and movements devoted to “consciousness alteration” and began a cycle of legislative repression that assumed that any other than the normal, rational state of consciousness was ethically wrong and politically subversive. To their credit, the Beatles rather consistently refused to align themselves with either group. Although there are clear references to altered states of consciousness in their lyrics, interviews, and films from about 1965 onward, and they made little attempt to conceal their own experimentation with drugs and, later on, various forms of meditation, they communicated in their works a sort of critical reserve that is mostly absent in so much of the Counterculture and its representatives. The Beatles, with their immense popularity and prodigious creative output, played a significance role in the formation of a “critical consciousness” which came to regard the “normal” state of instrumental-rational consciousness as itself irrational and, ultimately, immoral (the perverse and wildly exaggerated “body count” of the “enemy” on the daily news during the Vietnam era was a case in point). In one sense, simply as highly creative and innovative artists, the Beatles succeeded in opening a critical distance between the dominant form of rationality and new worlds of imagination (like “The Yellow Submarine”) from which the limitations and irrationality of the former could be revealed. More specifically, the two major avenues of drug use and, slightly later, Eastern meditation and mysticism also came into play such a role for them. What was then the dilemma that the Beatles highlighted for the popular culture of their day? If, on the one hand, we think that the normal or dominant mode of consciousness is irrational or immoral, producing such clearly immoral practices as racial bigotry, unjustified warfare, and the destruction of the environment, then it seems to follow that we are, in a broader sense, morally obligated to produce and occupy alternative states of consciousness that can counteract the “normal” one while not producing such results themselves. Put in this way, one might well, along with figures as Timothy Leary, Aldous Huxley, and William Burroughs, come to regard even drug use, exotic religious rituals, and sexual experimentation as themselves a sort of “moral action.” On the other hand, it is by no means clear that such alterations of consciousness are without their own immoral consequences, as the “Helter Skelter” scenario of the Manson family or later the Jim jones or Branch Davidian cults made very clear. But more, if both the “normal” state of consciousness and other “non-normal” states are equally capable of producing results that most of us would regard as immoral, where are we standing when we make such moral judgments about these consequences? In the face of such a dilemma, the Beatles once again maintained (or perhaps evolved toward) a sort of critical balance, If they first appeared, within limits, to endorse drugs and, later, meditation as providing potential platforms of the critique of “normal” consciousness, and disavowed political revolution in favour of “changing your mind instead” on the “White Album,” their last word seems to come on their final testament, Abbey Road, with the chorus of its first track, “Come together over me.” Despite their personal problems with each other, the entire Abbey Road album seems a new departure that has left behind the dilemmas based upon subjective states of consciousness in favour or interpersonal communication (“Come Together”), joyous affirmation (“Here comes the sun”), humor (”An Octopusses´ Garden” and “She came in through the bathroom window”), and even a concluding wink at the Queen herself. The artist and the philosopher share the same key mantra: Think for Yourself! An artist must of course create something unique. A lot of external challenges can help fertilize this (drugs, gurus, unjustified warfare), but in order to produce the unique, the artist can´t be attached to these external challenges. The Beatles were not philosophers, so we should not expect to find any clear answers to these questions in their work. Rather, they were gifted artists, part of whose genius was to have, with subtlety and intelligence, expressed some of the major dilemmas of our time and opened a creative space wherein we can confront them on our own. The Beatles are no more but the songs – and the questions – still remain.